A thorough training that mixes classroom lectures and realistic scenarios in the field. The Wilderness First Responder (WFR) is the gold standard the world over in first-aid education for outdoor professionals. 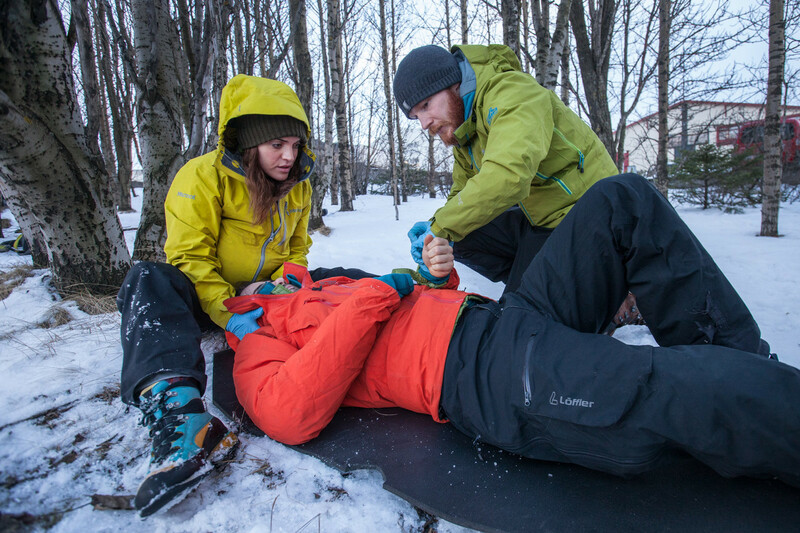 We have worked with the National Outdoor Leadership School (NOLS ) since 2015 to provide the very best first-aid education in Reykjavík, Iceland. The WFR course is designed to provide you with the tools to make critical medical and evacuation decisions in remote locations. Classroom lectures and demonstrations are combined with realistic scenarios in the field where mock patients challenge you to integrate your learning. The course will run regardless of the weather. Come prepared for wet, muddy, cold or hot conditions. All courses are taught in English by highly skilled instructors from NOLS Wilderness Medicine. We are proud to provide you with the highest quality of training and first aid education available. Prerequisites: No previous first aid training is required. You must be 16 years old to attend this course. Certification: Participants are required to pass both written and practical examinations to obtain WFR and CPR certification. Successful course completion earns you a WMI Adult & Child CPR certification and a WMI Wilderness First Responder certification. Housing for international students is currently not available, but we are happy to assist in any way we can. Please contact [email protected] for more information on possible accommodation or practical questions. Please note that not all dates are confirmed to run. Accessible to all people in good health. I just completed the ten-day WildernessFirstResponder course organized by Icelandic Mountain Guides last week and I could not have been any happier. Organization and information by Ívar beforehand was great. There were 31 people in our class and two stellar NOLS instructors flew in from the US to teach us. We had a transfer service for the international students. Classes and outdoor scenarios were held at Hjálparsveit skáta í Reykjavík (SAR) where we could use the kitchen facilities and some of the equipment. There were plenty of cookies and snacks to see us through ten days of studying and practicing. It was intense, challenging and so much fun. We learned how to assess the scene and our patient, to make decisions on spine protection and evacuation and how to treat a variety of injuries and illnesses. Our instructors were knowledgeable and always patient and ready to help. We did some solo scenarios, many team scenarios and some larger group scenarios, one of them at night, to let us practice our new skills. On the last day we had a 100 question written test and a practical test assessing one of our instructors. Everyone passed. I enjoyed the course so much that I am now thinking about taking the Wilderness EMT next. Thank you, IMG for organizing this course. It was amazing! © 2018 Icelandic Mountain Guides.All rights reserved.